Bye bye Asics. I’ve been a lojal fan for several years, but now I’m looking for a new running partner. Ok, so it’s my first blog post in english. The main reason being the importance of the subject. I really like brands all over the world to be able to read this. Some years ago I was motivated by a couple of collegues who had started running. So I did, and after a few weeks I was hooked! Since that day, I have brought my jogging shoes outdoors every week, about three times a week. I love it, I’m hooked! 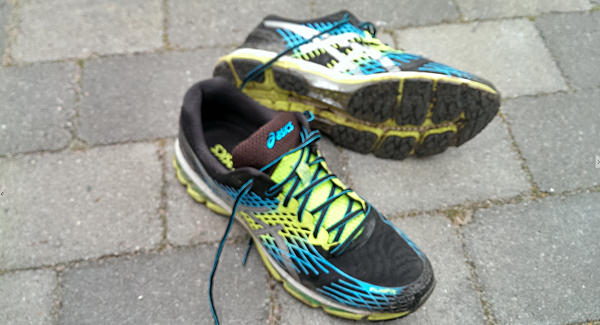 Since the beginning I have been a lojal fan of Asics – and the Nimbus series in particular. I did a scan of my feet at a point, and the scan confirmed the choice of the Asics Nimbus. Every year since the Nimbus 10 I have bought a new pair. I’ve even bought other models from Asics, like the Gel-Fuji Trainer. The Nimbus has been a perfect fit for my feet, both in terms of physical fit and cushoning. Then something happened this autumn. I bought a new pair of shoes from XXL – the Nimbus 17. They felt different than all the other models. More narrow shaped. I still decided to take them on a ride. The ride was not a good one, which usually is the case with brand new running shoes. But this time my heels got really painful and sore, and after 10 rides the shoes still not felt good. The heel part of both of shoes got a hole in them as well, and the underside of my feet regulary hurts when using the shoes. The shoe just feels cramped, cheap and just wrongly sized. I am totally unappy with the experience of the latest Nimbus. Still no reply. Complete silence. Asics might be such a huge brand they don’t think they need to reply to their customers. Or there might be other explanations. There might be missing internal routines, or misunderstandings between different departments. But as a customer I really don’t care about the reason. I just want a reply. All it takes is a little response. Brands who don’t respond on social media is such a big turn off. Now I’m wondering what my next pair of running shoes will be. I’m looking at the Mizuno Wave Kazan 2, Wave Ultima 7, or something similar. I usually run on gravel roads, only occasionally on asphalt. Feel free to drop me a line below if you have any recommendations. Other than Asics, that is. Thanks for all the good years Asics. Now I’m moving on.